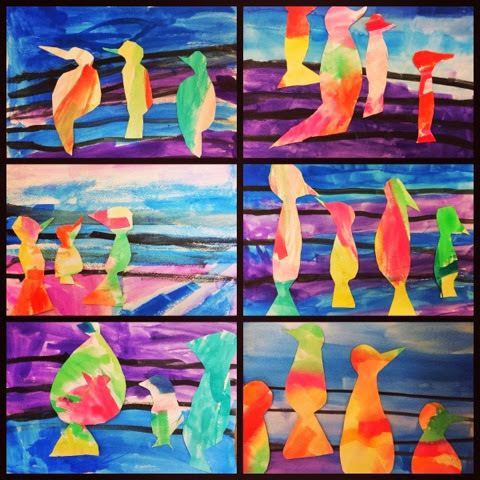 I spoke to the class today about warm and cool colors to create our colorful "Bird on a Wire" paintings. First, we divided colors into warm (red, orange, yellow) and cool (green, blue, purple). Then, I told the children we were going to move the GREEN to the warm side. We took one piece of water color paper and painted it with our warm colors + green. Abstract shapes filled the paper to the edges. I told the children to try not to overlap colors, but to cover all of the white on the paper. Using thick watercolor is important because I wanted the paper to dry quickly. We set aside the warm colored pages to dry. Then, we used a second page of water color paper and painted it with blues and purples in horizontal areas. When this was finished, we used black to create some "wires" across the page. We put this page aside to dry. Taking the warm paper again which was now dry, we flipped it over to draw on the back. I showed the class how to create simple bird shapes. Circle head, pear-shaped body (with heavy bottom), triangles for beach and tail. They drew the birds with sharpie markers on the back of the warm colored papers and then cut them out. When the background was dry, I showed the class how to place the birds so that they looked like they are sitting on the wire. We used glue sticks to stick the birds down, making sure the bottom of the pear sits on a wire.